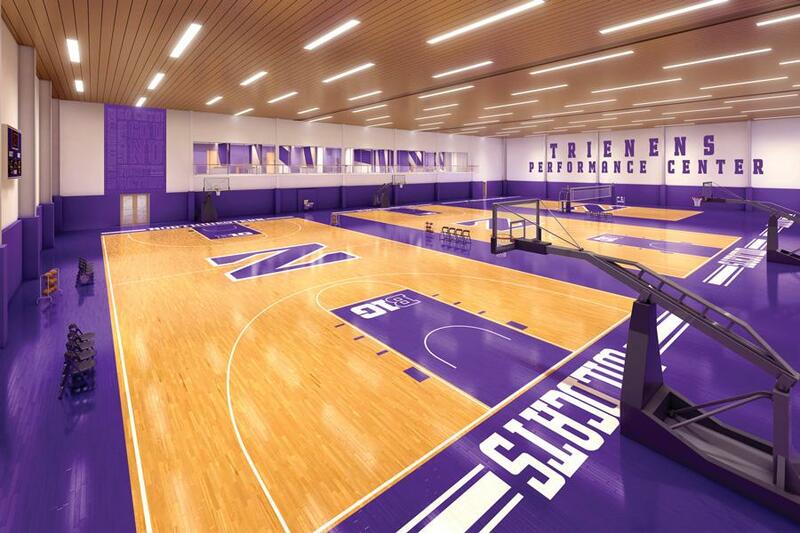 The Trienens Performance Center is slated to be included in an extensive renovation for Welsh-Ryan Arena. The renovations are made possible by donations from the We Will campaign and are set to begin after the 2016-2017 basketball season. A new multi-purpose practice facility will be added to renovation plans for Welsh-Ryan Arena, according to a University news release published Feb. 7. The renovation follows a $20 million gift from trustee Howard J. Trienens (Commerce ’45, Law ’49). The facility will be named the Trienens Performance Center and will include practice space for volleyball, basketball and numerous other athletic programs, according to the release. The center will also feature training and rehabilitation amenities, locker rooms for staff and teaching equipment for team meetings. According to the release, men’s basketball coach Chris Collins described the facility as a “game changer” for student-athletes. “What was already a dramatic transformation for our Wildcats now has been elevated even further,” Collins said in the release. The project is part of a $110 million renovation to Welsh-Ryan Arena and McGaw Hall slated to begin after the 2016-17 basketball season and finish in fall 2018. The renovations of Welsh-Ryan Arena will largely be funded by a gift from trustees Patrick Ryan (Business ’59) and Shirley Ryan (Weinberg ’61), along with donations from numerous other benefactors. Renovations to the arena will include new seating, increased accessibility in concourses, new locker rooms and a larger lobby. Athletic department spokesman Paul Kennedy said although the new practice facility was originally planned to be in McGaw Hall, the gift made it possible to locate it in Trienens Hall, which is located nearby. Though teams that currently use Welsh-Ryan will likely benefit most from the renovation, all athletes and teams will have access to the facility, he said. University President Morton Schapiro said in the news release that Trienens has been an “enthusiastic” supporter of the University and its athletics programs for decades. Women’s basketball coach Joe McKeown said it will be “incredible” for NU’s basketball teams to have access to both the Welsh-Ryan and Trienens facilities. He added that the renovations — such as team meeting rooms and new technologies for athletes — were developed based on other peer institutions throughout the country, particularly those in the Big Ten. The $20 million donation was gifted as part of the University’s “We Will” fundraising campaign, which launched in 2014 and has raised more than $3.3 billion since. Trienens has given to Northwestern annually for 44 consecutive years. “We’re just excited to have the opportunity to have a facility that’s world class and just represents Northwestern,” McKeown said.